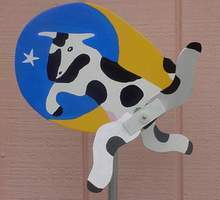 THIS IS THE COW JUMPING OVER THE MOON WHIRLIGIG !! THIS COW JUMPING OVER THE MOON TIMES SINCE HITCOUNTER WAS SET ON NOVEMBER 11, 2003! !